Federal University Lafia Post-UTME and Direct Entry (DE) Admission Screening Form, Eligibility, Cutoff Mark, Screening Requirements, Date and Time, Application Guidelines for 2018/2019 Academic Session. 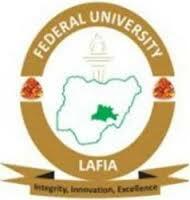 The Federal University Lafia has announced the commencement of admission Screening Exercise for admission into ALL COURSES/PROGRAMMES of the institution for 2018/2019 academic session. Online Registration commences on Monday, August 6, 2018 and ends on Monday, August 20, 2018.